Bet that title caught your eye as you were browsing. Well it’s true, safe to say I haven’t really pushed anyone down during splits or much of any flexibility for quite some time now. 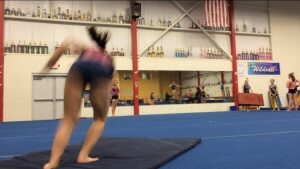 I had plenty of memories as a gymnast standing up after being pushed down in”flexibility circuits”, only to feel like a baby deer walking for the first time on new legs. Don’t worry, I still have love for all my former coaches. I will openly say I used to be in that mindset as a coach, but have dramatically shifted my views as I learned more during my physical therapy education. I haven’t followed that mentality in well over a year now. I want to make it clear, I am an advocate for mobility work and using stretching variations as a daily part of our gymnastics training. This article and my concern is more about the rationale behind aggressively pushing on gymnasts for more mobility like with splits, shoulder flexibility in bridges, and so on. 1. The Brain Is Smart. The brain and nervous system are incredibly good at what they are designed for. It’s been absolutely awe inspiring learning about how complicated the nervous system is, and how much work goes under the radar without us knowing. When our brain detects that something dangerous is going on in our body (say like someone putting their body weight down on us while were in an over split) it may pick up on this info and say “Woah, I don’t like this”. Any gymnast reading can relate to this feeling. Usually my brain gave me the “I think I no longer have a hamstring” signal, or the feeling of physical not being able to go any further. That incoming danger signal and your brains evaluation of the danger is called perceived threat. Pain or discomfort may be one way of the brain interpreting and responding to the perceived threat or danger. Another response which is often the case in pushing a gymnast down is the brain triggering a reactive contraction of that muscle in an effort to stay safe. If a coach or partner were to push lots of force down, the brain may respond right away to the danger in order prevent damage the hamstrings and other hip muscles. With this thought in mind, I think that no matter how much you say “just relax” (or unfortunately some people the solution of just pushing harder) the system will continue to be in hyper protection mode. This method might not only be dangerous to a degree, but really won’t do either the gymnast any good. Remember this whole process can go down on a subconscious loop. I honestly think that the action of a coach walking over to the gymnast to push on them initiate driving of the “danger” levels. It may further trigger this protective mechanism before the coach does anything. The past experiences of pain with getting pushed on, seeing other teammates in pain, or subconscious processes all may be driving a heightened ramp up protective response (sympathetic system). If we chose to pick the gymnasts hands up, get another coach to add to the stretch, use weights, or whatever a coaches method may be, I think were starting to flirt with a dangerous line and we need to consider if it may be doing more harm than good. Simply put, the brain wants to protect the body and a coach cranking down on the gymnast it may just be further feeding the danger meter to soar through the roof. Finding alternate ways to reduce the “threat” level or calm the system (drive the parasympathetic system), and encourage the brain everything is cool is really what we should aim for if we want to help encourage new mobility. Once we have that new mobility, we then need to build control and stability with it to encourage optimal use. This has been much more successful for me when working with both my own gymnasts and also with gymnastics patients, and I’m pretty sure my gymnasts appreciate it too. I think by knowing a little more about the “danger alarm”, the possible neural influence type idea, and exploring other alternative methods, it might be better and safer/more productive for everyone involved. Let’s face it, it’s usually the split that you can drive a truck under that gets out attention as a coach. Rather than just go into super coach mode, I urge you to think about why they are “tight” in the first place. I have hinted at this concept across a few different posts. Don’t get me wrong there are some cases where a gymnast may truly have a predisposition to mobility limitations and more mobility work would be warranted. I am far more confident that most issues in gymnastics are more related to the brain/body connection. Like I noted above, the brain responds to a perceived threat in danger in certain ways. For many gymnasts, I think they possess a huge range of mobility that may not be properly controlled for all the time. They may have poor fine tuned stability, they may be compensating, or they may just have technique errors. For whatever reason, this instability with high force and high velocity of gymnastics stacked on top of it may create the same “danger level “in the brain like noted above. As a result, the brain may choose to start tightening up muscles around the area as a protective response. Take the lower back of a gymnast for example. If the gymnast has an unstable deep core (no not that 6 pack) and operates in a constant arched lower back position, the brain may pick up on the constant force going through certain aspects of the spine and give the “Woah, I don’t like this” signal. In an effort to keep the back from arching more creating further stress, one response may be to fire the hamstrings on all cylinders in an effort to pull the pelvis and spine back into a better position. This may lead to the reports of “tight hamstrings” during a pike stretch or a visible restriction in the motion. I wrote articles previously displaying the hamstring scenario in a gymnast. Take the shoulders of a gymnast for another example. If the shoulder blade muscles aren’t helping out to stabilize the shoulder blade, the brain may pick up on the shoulder moving all of the place as a danger signal. It may then overuse or lock down larger muscles of their shoulders like the lats/subscap/teres, etc, leading to problems bringing the arms overhead. This may lead to a difficulty with this overhead motion, and also rough looking bridge. 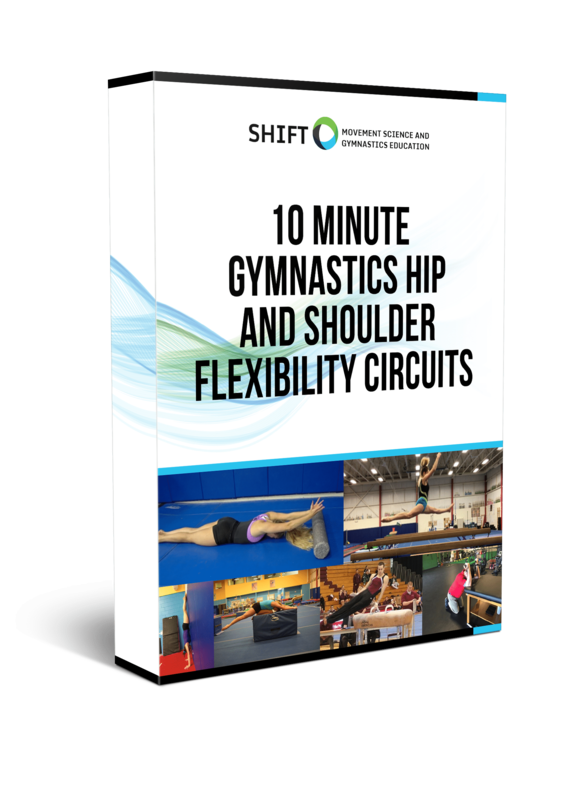 “Tight hamstrings” and “Inflexible Shoulders” are common complaints of some coaches and gymnasts. All of the gymnasts had great mobility at one point when they were younger, so what happened that made them suddenly get tight? Granted, the type of training gymnasts do can certainly lead to overuse and tightness in certain areas. This is why I have our girls do daily pre-hab soft tissue and certain activation drills to combat this. However, if the problem or tight hamstrings or shoulders is really due to a stability issue somewhere else simply pulling on their shoulders aggressively in the bridge or trying to fold them up like a lawn chair in a pike stretch probably isn’t going to help out. It takes a trained eye and full movement eval to pick apart the pieces and see whats going on. I like to use the SFMA model plus some other tricks I’ve learned to help out, along with some gymnastics skill analysis. I know not all readers have this training background, which is I always encourage gymnastics coaches/gymnasts to team up with a good healthcare provider to crack the case. I feel it’s well worth the time to save banging your head against the wall wondering why someone has horrendous splits, and also to save unnecessary pain for the gymnast. It can sometimes be a really quick fix. Not to leave this on the edge of suspense, but that’s all I’m going to offer up for now just to make it quick and easier to digest. I promise in a post to come I will expand on the last 3 reasons behind my thought process, including alternatives I use with our gymnasts instead of aggressive pushing in flexibility. Some of my articles have shown pictures of me helping to mobilize motion for my gymnasts, but I promise they are really not aggressive at all. It’s much more related to position, cueing certain things, and feedback. There are plenty of times I do offer mobilizations or stretches and give them to patients/athletes, but I’m very particular about how I have my gymnast go about the technique. It’s one thing to offer position and feedback or cue the movement, it’s another end of the spectrum for the excessive pressure and discomfort. Ben M, Harvey LA. Regular stretch does not increase muscle extensibility: A randomized controlled trial. Scand J Med Sci Sports. 2010;20(1):136-144. doi: 10.1111/j.1600-0838.2009.00926.x. Agree. Stopped pushing down in splts over a decade ago. 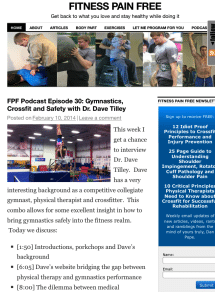 Only pushing I do now is PNF facilitation, and that only when a gymnast seems “stuck”. 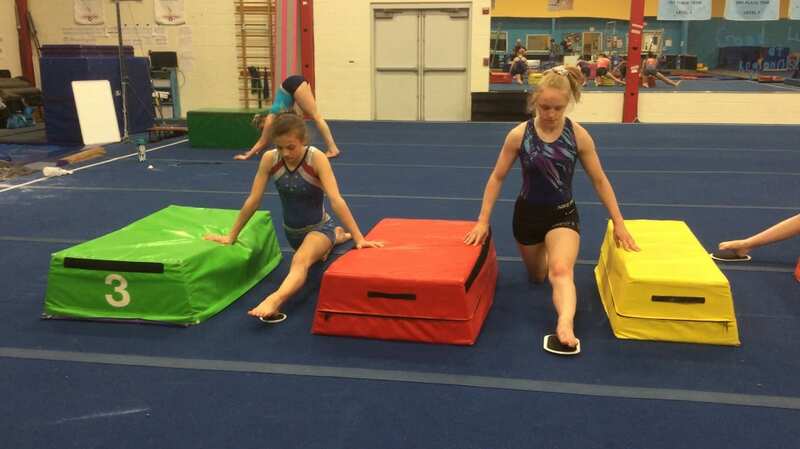 All of our team gymnasts (about 40 kids) can oversplit with their feet on 10 panels of mats, both left and right. And we get there without pushing – just giving them goals to achieve and keeping at it until they get there. We have found we need to do a lot of corrective work on alignment, and lots of work on active flexibility as well. Still, developing a good passive range is a good place to start. That’s great James. PNF is a great technique to help encourage more mobility and promote motion, I use it a lot. Sounds like from your results your going about it with a good mindset. I agree with the need for lots of daily corrective work in an effort to stay ahead of issues, it’s a huge part of our warm up. I also agree on your active flexibility, this goes on the notion of not only gaining lots of mobility but developing control and good technique transfer to gymnastics skills. Always have to reinforce it with good form/progressions during training. Static positioning can give you a good idea of where things are at but it can also lead you astray if not thinking holistically about the whole system. Like I said I think there are many apparent mobility restrictions that are just neurological compensations. Have to always be open to many different explanations. Thanks for reading and commenting! Thanks to many a coach pushing me down during splits, I can appreciate a sore hip and torn labrum every morning. Thanks for writing such a great article.. I used to think that overstretching was the most appropriate way to get muscles extended and increase its range of flexibility…boy was I wrong! I realized it when I observed my worst inflexible athlete having the best switch leg and switch half leaps, while my super (passive) flexible gymnasts would constantly go to about 150 degrees (what do I do, push them down more or pull legs up harder – NO; they are already at overstretch in their passive range)…DIAGNOSIS: Understanding muscles, ligaments and tendons dynamic active leaps really comes from strength – but skill specific. PNF, weighted resistant kicks, followed with active holds (isometric resistance) is the most effective technique for rapid improvement for increasing leaps and jumps flexibility. This automatically improves the passive range! Awesome article -Train smart, not hard! Thank you for this interesting article. It made me think about one of my stiff gymnasts. I could not understand how flexibility could get worse and not better despite every day stretching. I would really appreciate an advice on how to overcome this stiffness? What would be the optimal time for static unassisted stretching for one leg per training? What are the best active stretching exercises? I apologize if you have all this already written, I haven’t look yet through all of your articles, I would appreciate if you could send me to a relevant source then. Many thanks again and Happy New Year! Hey Nina! Thanks for checking out the article and the website, I really appreciate it. It’s hard to say without the gymnast in front of my to look at, but I can offer some possibilities. In terms of continuing to see a lack of progress for your gymnasts mobility despite stretching, this is actually common. It could be a matter of underlying instability or a lack of stabilization in the area that is creating the ongoing stiffness. In a simplistic way, if the brain detects that a part of the body is unstable and is fearful of injury or a threat, it may respond by creating protective stiffness to stay safe. This may be why the stiffness continues to persist despite stretching, it may not be really about the length of the muscle in question. For this situation, the first best place is to get a movement exam to see if this is the case. Along with this, proper breathing strategies can be really powerful to help relax the tensioned muscles with proper mobility work. Also, light foam rolling and soft tissue work may be a good way to affect the neural tone in those muscle groups, which can then be transferring into stretching. Personally, I don’t do a lot of static stretching with my gymnasts to increase mobility as there has some been some research questioning its effectiveness and long term carry over. Those studies are at the bottom of the article if your curious.I tend to go with soft tissue work, breathing, making sure stability is good if needed, and dynamic mobility drills to get range of motion. Thanks again for reading and commenting, Hope this helps!